“The last thing Americans should have to do, over the holidays or any day, is comfort the families of people killed by gun violence — people who woke up in the morning and bid their loved ones goodbye with no idea it would be for the last time. And yet, two days after Thanksgiving, that’s what we are forced to do again. We don’t yet know what this particular gunman’s so-called motive was for shooting twelve people, or for terrorizing an entire community, when he opened fire with an assault weapon and took hostages at a Planned Parenthood center in Colorado. What we do know is that he killed a cop in the line of duty, along with two of the citizens that police officer was trying to protect. We know that law enforcement saved lives, as so many of them do every day, all across America. And we know that more Americans and their families had fear forced upon them. This is not normal. We can’t let it become normal. If we truly care about this — if we’re going to offer up our thoughts and prayers again, for God knows how many times, with a truly clean conscience — then we have to do something about the easy accessibility of weapons of war on our streets to people who have no business wielding them. Period. Enough is enough. The President is speaking truth to the gun lobby’s power. It’s a dirty job but someone has to do this. If we don’t deal with our own domestic terror attacks, occurring almost daily now, then we will have failed our children and our citizens. The identity of the shooter has been released, along with a photo. Please note that this was a white man and not a Syrian refugee or a foreign terrorist. He had an AK-47. So who should we fear more? Syrian families with young children trying to escape the torture and violence happening in their own country or (mostly) white home grown terrorists shooting innocent people up in places all over our country. For surely, there was terror involved in the hours long siege at the Planned Parenthood clinic in Colorado Springs. I’m sure my readers will remember that just a month ago, on a different holiday, the streets of Colorado Springs were the scene of yet another act of terror committed by a young white man walking around with an assault rifle as if it was normal. But, alas, he could have been just an every day open gun carrier exercising his rights until suddenly he wasn’t. America at its’ worst. What’s normal in America? 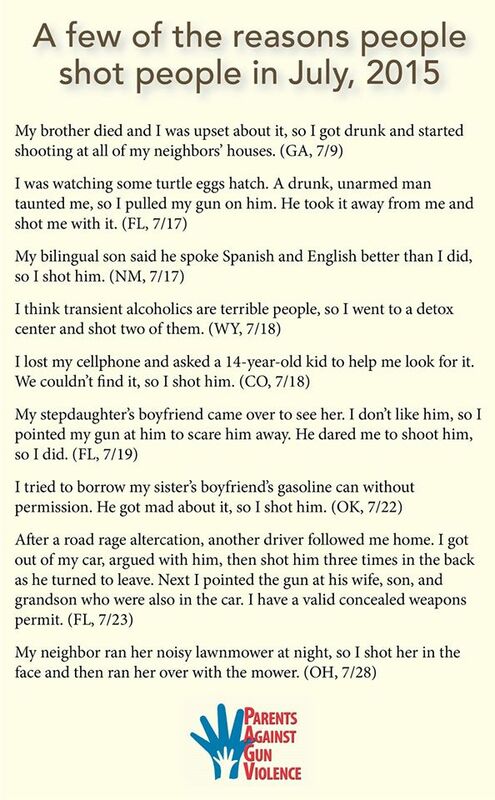 Let’s look at a few recent incidents involving gun owners for how normal these shootings have become. A “law abiding” gun carrier shot a waitress at a Mississippi waffle restaurant because she asked him not to smoke inside. She died. A South Carolina felon who should not have had a gun in the first place, got away with murder because of Stand Your Ground legislation. Bloggers and others are keeping track of this nonsense. David Waldman of the Daily Kos’ GunFail is finding the “accidental” discharges by law abiding gun owners and reporting on them. I have written far too many times about such negligent and irresponsible gun owner failures to use their guns in a safe manner. The only conclusions we can draw from the mass terror shootings like the one at the Colorado Springs Planned Parenthood clinic, men walking the streets with assault rifles, terrorists access to guns in American, “accidental “gun discharges, domestic shootings, gun suicides, toddlers shooting themselves or others is that we have a gun problem in our country. We are not using common sense or the necessary outrage and courage to change much of anything about easy access to guns. Why not? The corporate gun lobby, of course. The public discourse has become more and more loud and violent towards refugees, people of color, women, Planned Parenthood clinics, President Obama and politicians who don’t agree with people mostly on the far right spectrum of politics. Inevitably this is going to lead to shootings or threats of violence towards all of the above. What happened in Colorado Springs may be one example. Threats of violence had already caused this clinic to take very strong security measures. Clinics across the country are now in fear of the next terror attack because of this one. That is the purpose of terror attacks. How can we separate the fear, intolerance, terror, racism and violence mongering from what happened in Minneapolis in the shooting attack against Minneapolis Black Lives Matter protesters? Combined with gun lobby propaganda and increasingly threatening militia groups, the American right wing is fomenting racial and ethnic violence and insurrectionism that threatens the core values of our country. “The NRA is no longer concerned with merely protecting the Second Amendment’s right to bear arms – the gun lobby wants to use those arms on its fellow citizens. Or, as the NRA thinks of them: “the bad guys”. It is useless to argue that the NRA is only targeting criminals with that line, because the NRA has defined “good guys” so narrowly as to only include the NRA itself. What does that make everyone else? We are on our own. That is a certainty, no less certain than the absolute truth – a fact the powerful political and media elites continue to deny, just as sure as they would deny our right to save our very lives. The life or death truth that when you’re on your own, the surest way to stop a bad guy with a gun is a good guy with a gun! Yes, America, we have a serious problem. Violent and fear mongering rhetoric is fueling the flames of intolerance and insurrectionism in our country. In combination with far too easy access to guns of all types, we have created a monster that is now rearing its’ ugly head. It’s past time for us, as Americans, to decide on our morals and values. 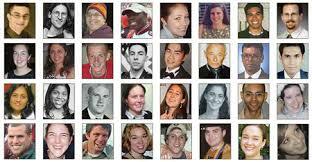 Do we value the right of people to live without devastating gun violence or do we value gun rights more? I know my answer. We are better than this. Well, we should be anyway. The fact that we aren’t is frightening. If this continues, we will not be living in a democracy for much longer.